As I said in a previous post, I started to read “seriously” the 5E Monster Manual to get a better feeling of its implied setting. My issues with 5E are quite simple – I have none. However, 5E is my eternal “second choice” game. For example, I’m indulging like hell my Old School preferences right now – with DCC RPG. If I want something a little more “robust” (or I just want to please most of my players) the choice would be Pathfinder. If I want something different but still d20, I’d try 13th Age, Exemplars & Eidolons (or Red Tide, or Godbound), Beyond the Wall, Fantasy Craft, Iron Heroes, even Hackmaster. And if I really want the Old School I would go to AD&D 2nd, Rules Cyclopedia, OD&D etc. I just don’t have (so far) any use for my 5E books (to make things even crazier I even prefer the Playtest Versions of 5E rules and my favorite module still is Ghosts of Dragonspear Castle). With the release of Volo’s Guide of Monsters (and Cubicle 7’s Adventurers inMiddle-Earth), I’m trying to give 5E a second chance. So I’m reading the Monster Manual and seeing what implied setting I can get from it. If I get any ideas about a particular critter I’ll post them here. Before that, it’s always cool to give direction to better (and more awesome) stuff along these lines. So, if you want a new approach to 5E Monster Manual, please, read this. I’m never gonna write something as good as that. Cool art demands Race Stats for PCs! 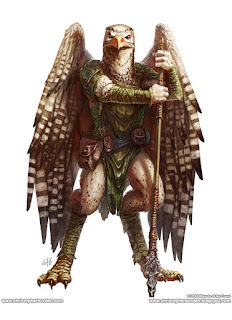 OK… the first entry is about Aarakocra, those birdmen that I discovered back in the AD&D 2nd Monstrous Manual* and that are (visually) a lot more cool now. Aarakocra in 5E are flying humanoids from the Air Elemental Plane, servants of the Winds Dukes of Aaqa and so linked to the (short but evocative) Red of Seven Parts mythos. They’re neutral good creatures with a CR of ¼ (and racial enemies of gargoyles). *Still the best Monster Manual ever; except, maybe, for some of those wonderful Planescape Monstrous Compendiums. The Fiend Folio art was better. Unfortunately, about Aarakocra, that’s all. 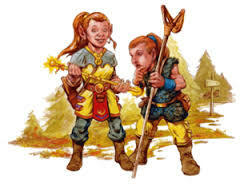 Even with 5E concise and iconic description, there isn’t much here to really engage you. Ironically, the best part for me was the “kenderish” bit about Aarakocra not understanding concepts like material value, property or political borders (ownership I guess). I’m very inclined to a run a D&D-like game with shades of grey and a twist or two to the common tropes. Thus, I prefer adventures and encounters where the solution isn’t “Kill them all and take their stuff” (I’m already having a blast with my DCC RPG sessions, where the PCs are reavers, heretics and bastards of the best sort). The conclusion: I’ll use Aarakocra just to run an adventure instead of stablishing any concept for my 5E games. That’s why I made this post a Little Encounter. I’d keep Aarakocra as natives of the Air Elemental Plane with a twist: in order to reproduce, their eggs must hatch in the Material Plane (otherwise, they either don’t hatch or strange air half-spirits are born instead of Aarakocra). So, the Aarakocra keep secret eyries in the Material Planes, close to portals to the Air Elemental Plane. In the particular mountain range where the PCs are, the portal is the eye of a cyclical storm. The humans (or dwarves or whatever common humanoid civilized race you’re using) are colonizing the mountain range and cleaning it of “monsters” in order to mine precious metals and gems. Because Aarakocra don’t understand the very concept of ownership, they’re a constant nuisance to the local towns, flying down and “stealing” stuff (mostly objects for which they’re curious). The problem starts when the Aarakocra eggs go missing. The birdmen get more aggressive in their searches. They don’t blame the humans but – remember – they also don’t respect property and probably privacy. They’re now invading houses, taverns, deposits etc. Things are getting violent. The PCs are hired to kill or otherwise get rid of the damn birdmen. 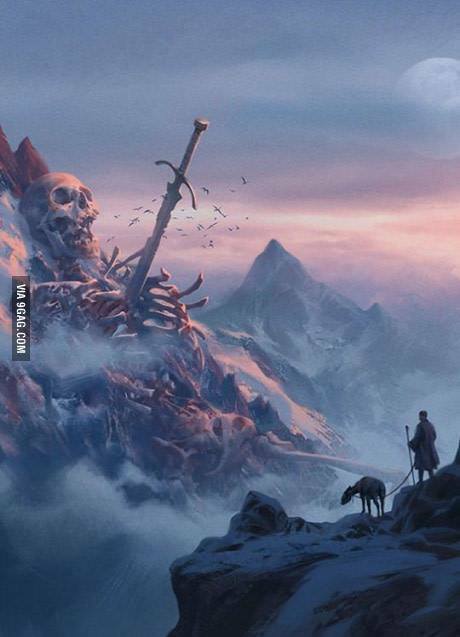 This can be accomplished quite easily if they manage to climb the eyrie. The Aarakocra are many but hardly violent. However, if the Aarakocra are simply destroyed, the cyclic portal to the Air Elemental Plane will become uncontrollable and the next storms will be catastrophic (with massive amounts of air elementals released, probably dislodging dangerous beings that live at the mountain tops… things like giants, dragons and flying krakens**, which will probably banish any humanoid presence in the region). **Probably the only thing I ever liked about Forgotten Realms 4E. Unfortunately no flying krakerns... but who knows! If the PCs are smart (or just diplomatic) they can discover about the Aarakocra’s eggs and start investigating. The culprit will probably be a flying or teleporting thief. I would use a high-level wizard with a flair for drama (he leaves a rune behind to mark his daring thefts). This wizard is a high-level menace and can be easily tracked. However, it’d be suicide to face the magic user in battle. No problem, he won’t mind telling the party that he was hired by a very rude merchant from one of the towns that were attacked (the merchant was rude and arrogant, but paid well). The merchant in question is indeed very rich but can be faced by the party. He discovered that Aarakocra eggs are worth (flying bodyguards are useful). He also believes that by stealing the eggs will destroy the local eyrie. He doesn’t know (or believes) in portals to other dimensions and such. Actually, you can create a merchant that isn’t a “capitalist greed-driven evil schemer” cliché and even establish that he’s really trying to improve the region and end the “birdmen menace”. The problem about facing the merchant is that – until the eggs’ theft is proved – he has the law by his side (the town guard, the sheriff and maybe even a paladin if you’re feeling mean). If the party can sneak into the merchant’s caravan/deposit/mansion/secret evil base and get the eggs everything is fine. You can even add a timer to the adventure, by implying that the Aarakocra will unleash a particularly big air elemental against the local towns if the eggs aren’t found (or after two or three Aarakocra are killed searching for the eggs). OK. Drama set. What are the rewards? (Because just saying “You saved the region and avoided a war” is boring). 1. The local towns will see and treat the PCs as heroes (or maybe as villains, if the Aarakocra end the adventure causing too much trouble and the PCs back them up). - The Aarakocra are now their allies and the party has safe (aerial) travel through the entire mountain range, with access to places before deemed unreachable or too costly to go (i.e. insert adventure hooks here). - Aarakocra don’t care/understand property and treasure. While this means that the party can lose an item or two, they also have access to the Aarakocra lairs, where they can pick a lot of useful stuff that is just lying around (gems and items that the Aarakocra found scattered all over the region). - If the PCs were really diplomatic and impressed the Aarakocra I would let the birdmen teach them their cool Dragonball-like dance for summoning air elementals (besides teaching the PCs the air elemental language). This is the kind if unique and special reward that I really enjoy in adventures (and that games like DCC RPG encourage a lot). Your new flying friends can get you there! Thanagarian – a new DCC RPG class!